Interests:My Grandfather Edgar Simms and all who served with the 7th Service Battalion Yorks and Lancs Regiment (Pioneers)<br /><br />Passchendaele-The Somme<br /><br />Every time we visit a cemetery we pick out a grave of an unknown and place a poppy cross. I have a copy of the History of this Regiment,if anyone has a family member they would like to enquire about please let me know.My Grandfather Edgar Simms served with the Regiment and survived the War. Hi joan, Vague request but looking for John Edward OATES or Harry ADAMS. Vague request but looking for John Edward OATES or Harry ADAMS. That wouldn't be a Harry Oswin Adams would it? Apologies it has taken so long to contact you but have just found this thread. Any mention in the book of James Bowd ? He was my great uncle, posted to 7th Yorks & Lancs from RGA, must have been a change for a lad from Egham, Surrey. Look forwrd to your response. Location:Batley, in the old West Riding of Yorkshire. Interests:Rugby League, Fig Rolls, Fig Rolls, Rugby League. Gentlemen, I have not heard from JoanTel for ages. I have a copy of the said book, I'm about to have my tea and will have a look afterwards. Hello JonBowd, there is no mention of him in the History book of the 7th Battalion. 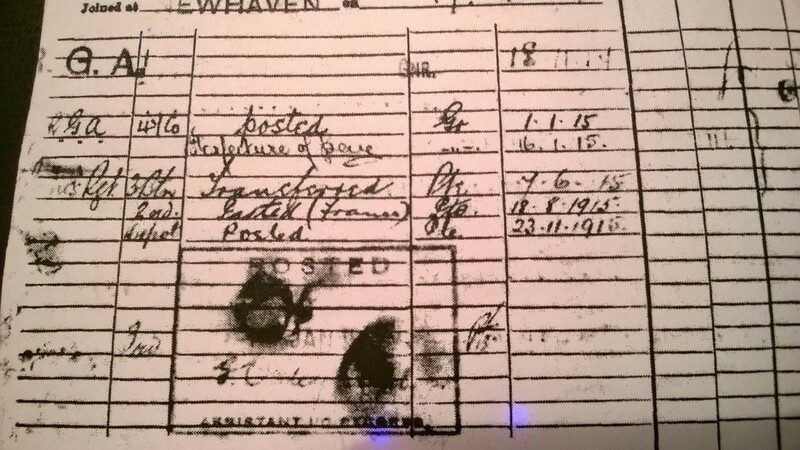 According to his Service Record he never served in the 7th Battalion. He first enrolled in the RGA then due to something I quite can't make out he transferred to the York and Lancaster Regiment first with the 3rd Battalian, then the 2nd and briefly the 4th, then he was wounded out looks like shell fire damage. The only thing mentioned about him is that he was in "D" coy and he was killed by shell fire. I have a copy somewhere of the war diary I could have a look over the weekend and see if I can gleam anything else out. Would you be able to help me out? My great grandfather, Ernest Tomkins, was in the 7th Battalion of the Yorks and Lancs. Is there any information about him? Findmypast have some records (including service papers) for a 12447 Ernest Tomkins (born circa 1895, resident in Woodhouse, Sheffield), who served with the 7th Battalion. The record search results can be seen here. If the records are for your great grandfather, they show that he joined up on 1st September 1914, and went abroad on 13th July 1915. He was wounded twice (once accidently), and was eventually discharged "surplus to military requirements (having suffered impairment since entry into the service)" on 18th March 1919. Forces War Records have a transcribed hospital admission/discharge record for 12447 Tomkins from 1916. My guess would be that the record relates to his initial accidental wounding, and would probably contain a few bits of information which aren't shown in his service papers. As well as FMP, Ancestry should also have a copy of the service record. They also have an original image of his Silver War Badge record (FMP only have a transcription). They also have original images of his Medal Index Card, 14/15 Star Roll, and British War Medal & Victory Medal Roll. If you were to want a copy of the Battalion war diary it is on Ancestry here, but is easier to download (due to the file format) from the National Archives here. It is unlikely to mention Ernest by name. There is good advice on researching soldiers on The Long, Long Trail - here. Thanks, that is him. He lost the use of one arm and was blinded in one eye. He struggled to find work after the war and my grandad grew up in grinding poverty. Ernest died in Sheffield in 1953. Roger please accept my apologies for not spotting your April 2016 response to my query to joantel in March 2012. So signed up RGA on 18/11/14 at Hounslow, 19/11 at Newhaven (fort ? ), 1/1/15 posted, 16/1/15 forfiture of pay, 7/6/15 transferred 3 Y&L, 18/8/15 posted France. From the looks of the info it didn't take him very long to upset someone !! If you could provide any dates for his service with those other Battalions it would be much appreciated, or pehaps you could direct me to where such info can be found. As you state he was discharged wounded in September 1917. Looking at what they were all up to would I be right to assume that he ended up in the 3/4 Battalion ? Mar 1915 Formed and then moved to Clipstone. 01.09.1916 The 4th absorbed the 5th as part of the West Riding Reserve Brigade. Oct 1917 Moved to Rugeley, then Woodbridge and Southen by 19.10.1918. Sorry I have not spotted you both before now, where does the time fly. 7Y&LP with the time of year, is it alright if I have another look after Boxing Day, if I get chance before then I will. Hello Roger, you have got back to me much quicker than I got back to you so I am in no rush. I look forward to you further comments as and when. I wish you and yours a happy christmas with best wishes for 2017 - till next time, Jonathan Bowd PS I may have to change my site names now but 324Y&L could get confusing ! Hello there 7Y&LP, this handle is fine lol. Forces War Records have a transcribed hospital admission/discharge record for 12447 Tomkins from 1916. Do you happen to know whether Forces War Records derives this info from the soldier's service record, or is there a separate listing of hospital admission/discharge records ? My own grandfather was in hospital at one point, but his service record did not survive the 1940 fire. I believe that they are transcribing the MH 106 records held by the National Archive. Unfortunately, though the record set is just a small sample of the original records, the rest believed to have been lost/destroyed (see here). All very frustrating! Many thanks for that link; I'll give it a look while keeping my fingers crossed! Best wishes for Christmas & the New Year. I have the Death Plaque of a 2Lt who was commisioned into 3rd Regt August 1917 but Transferred to Raf in June 1918 from the 7th Batt. Do you have any mentions of him either in the book or war diaries? We have not heard from Joan for years. I have the History Book and also the war diaries for the 7th Y&L's it was my granddads Battalion. 2nd Lt Frank Arnold Parfitt is first mentioned as having joined the Battalion along with others on the 25th October 1917 and posted to B company. In March 1918 the Battalion was reduced fron 4 companies to 3 and he once again mentioned as being posted to B company along with other officers and men of the old D company, so at some point he must have be attached to D company. At this moment in time I have not found his move from the Y&L's to the RAF. I have him as joining the 'School of Aerial Gunnery' on 27 July 1918 - officially he was 'attached' and therefore possibly still on the 'books' of the 7th Batt? What areas and battles were the 7th involved in from Oct 17 to July 18? During the period you are asking about the Battalion was heavily engaged in creating and maintaining a light railway system along with trench digging and repairing and also some times acting as front line infantry sections. The war diaries are heavy going but worth it. The war diaries are available to down load on line for just over £3.00. I was bog eyed last night reading it again, but I will have another go at it for you.